It seems that every location has that one place that a lot of expats like to gather for one reason or another. Maybe it’s a convenient location, maybe the food is good, maybe the drink is nice and cold or maybe it’s a combination of two or all 3 of them. 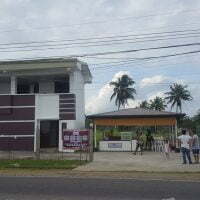 It seems for us here in Calbayog, that location is shaping up to be the Mango Lounge. It’s not a very convenient location for all expats in the area, but it is for some of us, especially me. Their location is less than 100 yards from my house. It is on the southern side of the city, so those that live on the North side are a bit out of the way. Several of them still make the trip here though, even though it could take up to 1/2 an hour to get here. Why? Because it’s working on being the “happening” place. It’s not much of a place yet, but there are plans to expand. As of now, the main area has a roof along with some canopies and sometimes, when it rains hard, the rain blows in, but it’s not so bad. There is also an upstairs area that is covered on top but only on 3 sides. It provides a nice view of the ocean and any sunrise or sunset though. That area is considered the Sports Bar because it has a big screen TV and a bar. You can get the local sports on the TV and non-local sports, like the NFL are being worked on. We might have to watch it delayed, but it’s better than nothing, especially if we do not know the score. First of all the Mango Lounge has good food. More importantly, in addition to having Filipino food, they have western style food. The owner is the key factor he as he is open to trying new dishes on a regular basis. Also, they have an excellent head chef. They have the best steaks and burgers around the area. An approximately 10-12 oz steak with onion rings (or fries) and a small salad is only P450 ($9). The burgers are P250, P300 or P600, depending on the size you get. (FYI, getting the P600 burger is like getting 4 of the P250 burgers). They even have a very nice seafood platter (P1000) that my wife really likes, although I do not eat seafood. Also, their drinks are nice and cold, especially the beer. Just recently, every Wednesday we have declared Games Day. We bring some board games, cards, whatever and then determine what we will play depending on who shows up. Right now we are mostly playing Cribbage and chess. I’m hoping to get them started on my Empire Builder. I think they will be hooked if they just try it one time. When I started this post I was not sure exactly what I would put in here, but then I remembered that there are a lot of pictures I can put here. I collected some of those and ended up with 13 (so I deleted one of them), but here is the link to the Mango Lounge Facebook page so you can see any or all of the pictures and everything else there. Mango Lounge and Estates Facebook. (they also have apartments for rent). I think the pictures and an explanation of each picture, will be in my next post. They have also recently started a new enterprise at Mango. I will get into that in the next post also along with any other plans that I know about for them. Any plans that are not secret anyway. This is awesome john i appreciate the support. No problem. You’re doing a good job there. I have another story coming out in a couple of days, so be sure to be on the lookout for that one also.